SERVED: The other night I received my weekly Rotten Tomatoes newsletter in my inbox to see what the critics are saying about the latest films opening. But as I read something I never have seen before: a 0% rating. You see on Rotten Tomatoes, they amass all the reviews and create a percentage rating and deem it fresh or rotten. I've seen low scores before and had a good laugh, but I don't recall seeing a 0%. I'm sure many films have had it before (if you Google the subject matter, Disaster Movie also got a 0% originally but a random critic from Australia gave it a good review), but this is just hilarious to me. A movie so bad every single critic hated it. I checked back in on the site and 1 reviewer from the St. Paul Pioneer Press actually gave a positive review thus moving Furry Vengeance to a 2% positive and ruining all the fun. Judging by his review, I guess what he looks for in a movie with animals is their lack of human voices, so I guarantee this man wrote a good review to one day get his review put on DVD packaging. 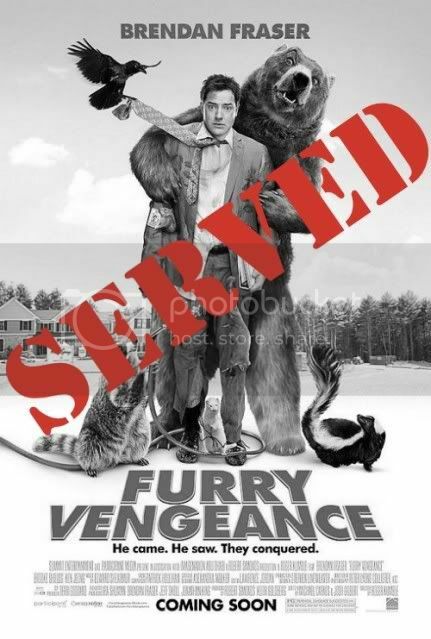 I am SERVING Furry Vengeance for being a total bomb. Basically unanimously panned by critics and a dismal box office ($6.5) million, this goes to show kids aren't as dumb as studios think and can spot crappy movies from a mile away. SERVED!